A woman accesses Facebook in Ho Chi Minh City. One in every three people in Vietnam – with a population of 90 million – logs onto Facebook at least once a month, the latest data released by the world’s largest social network shows. Facebook now has 30 million monthly active users in the country, with 27 million accessing the social network on their mobile devices, according to statistics obtained by Tuoi Tre (Youth) newspaper. In late 2012, only 10.6 million Vietnamese used Facebook at least once a month, according to data by InternetWorldStats. The latest Facebook statistics show that 20 million Vietnamese access the social network on a daily basis, 17 million of whom do so with their smartphones or tablets. Each Vietnamese user spends an average of two hours and 30 minutes on Facebook every day, mostly connecting with friends and visiting Facebook pages run by brands and shops. 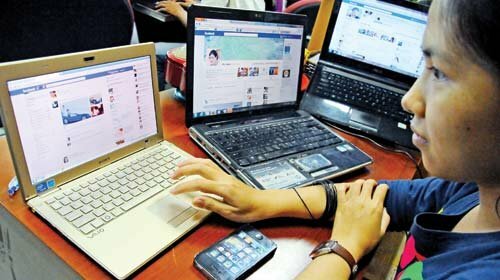 The Vietnamese spend twice as much time on Facebook as the amount they use to watch TV, according to the data. The Facebook pages that are most visited by Vietnamese users are those of the fashion and beauty, dining, and travel promotion categories. More Vietnamese moms are using the social network to share their daily moments and special milestones in life. Founded in 2004 by Mark Zuckerberg, who is now its chairman and CEO, Facebook boasted 1.44 billion monthly active users as of March 31. The world’s largest social network, headquartered in Menlo Park, California, was visited daily by 936 million users. About 82.8 percent of Facebook’s daily active users are outside the U.S. and Canada, according to its company profile.